NVMe capable SSDs are growing increasingly popular these days, offering much higher transfer speeds than the usual SATA drive. Just for comparision reason, a modern NVMe drives can easily offer up to six times the transfer speed of a SATA SSD. New markets always offer new opportunities and that on the other hand means that different vendors will launch new products. Corsair is one of those having presented their new Force MP300 NVMe SSDs. The new MP300 NVMe SSD is going to be available with 120GB, 240GB, 500GB and 1TB capacity and they use 3D TLC NAND memory. Like most NVMe SSDs out today, the MP300 NVMe SSD makes use of the M.2 2280 form factor and a PCIe Gen 3.0 x2 interface. Talking about performance, sequentially reading these drives should achieve up to 1'600MB/s and 1'080MB/s in the case of sequential writes. All the drives are backed by a 5 years of warranty plan. 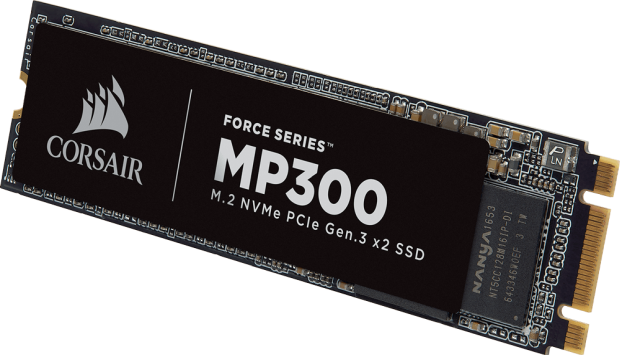 With the Force MP300, Corsair adds an entry-level NVMe SSD with affordable prices. When it comes to pricing the Force MP300 120GB is going to set you back $49.99 US and the 240GB version is going to cost $84.99 US. Regarding the 500GB and 1TB models, Corsair has mentioned that they will be priced at $154.99 and $319.99 US respectively.